Aluminium and I have never got along. I never had much luck machining it and even when successful I haven't enjoyed the experience one little bit. But sometimes you just need to roll up your sleeves, bolt some on the table and go for it. This is one of those times and this is how I got on. 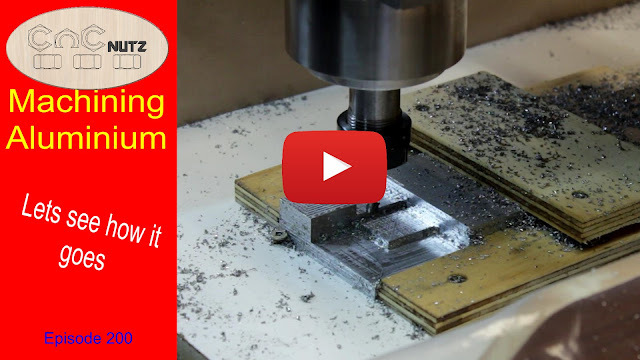 I used to opportunity to try different machining strategies and I share a few of my findings. I hate machining Aluminium and will continue to avoid it. The mess it makes is hard to clean up and I don't want to vacuum it up as little bits on metal in my vacuum does nothing for me. I would like a mill one day but that isn't going to happen anytime soon. The box I built with the plastic to covet the table was well worth the effort. Best machining parameters I found for my machine. Your machine will almost certainly require different settings but these are a good starting point. I used CRC CDT cutting fluid but I also found it seemed to cut OK without lube. All my final cuts were done using lube to try and get the best finish as was the VCarving. The lube did have the advantage of binding the swarf together and stopping it flying around the workshop. If it does get on your MDF table clean it up as the lube will soak into the MDF if left. Over the Christmas New Year I started working on a problem I had and how it coud be solved. This is what I came up with but you will have to wait for the next episode to fine out. I assure you it will be worth the wait. Thanks for watching and until next time. Peter, congratulations on your 200th episode. We are arriving in your part of the world in about a week for a 3 week tour around both islands. Thanks for all your work, especially the almost impossible Challenge last November. Hope you enjoy the sites of our country. Hey Peter, really like your videos, my machine has about the same rigidity as yours and I too suffered from the aluminium blues. I get pretty good results from having the spindle at 24000 RPM, eBay 6mm two flute end mill,.5mm depth and 2000 mm/min feed.At the finish of machining the cutter is not hot and nor is the workpiece. The chips take away the heat.